V&SAR Joint stock wooden sleeping car Angas was built at the Victorian Railways Newport Workshops (by contractors Scott and party) for use on The Overland. See also V&SAR sleeping cars: Acheron, Baderloo, Barwon, Coliban, Dargo, Finniss, Glenelg, Inman, Loddon, Onkaparinga, Pekina, Tambo, Torrens. 4.1950 Victorian Railways equity brought by South Australian Railways. 1953 Exterior rebuild for use on the night train to Mount Gambier. 9.11.1976 CME Report: The damage to the Angas sleeping car isconsiderable.... the vestibule interior is burnt out. It would require new lavatory and conductor's compartment, foor, doors, end and roof members. Side members on the car end of the doorway could be sound enough and not want replacement. Bunks, seats and carpet have been destroyed. Compartments 3 and 4, 5 and 6, 7 and 8, have charred woodwork, paint burnt off ceiling sheets and considerable reworking of timber and replacements would be required to rehabilitate them. The corridor... is similarly badly affected with charred woodwork, blinds and carpet damage, and paint burnt off metal ceiling sheets which are badly buckled. Mirrors throughout the car with the exception of the last two bereths (17, 18, 19 and 20( are badly smoke stained and would need stripping and and resilvering. Compartmnts 9 and 10, 11 and 12, 13 and 14, 15 and 16 are badly smoked stained on woodwork and ceilings and similarly the adjoining corridor. 3.1995 Australian Railway Historical Society approved disposal of carriage to "Kadina to Wallaroo Tourist Railway". 19.11.1995 Transferred from Dry Creek to Kadina. - Sold to Australian Train Movers, and transferred to Londonderry, NSW. 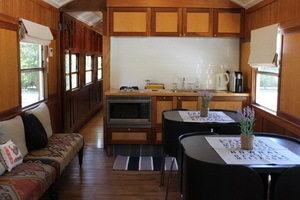 1.2011 Delivered to Little Forest Country Cottages in the Southern Highlands, NSW. 11.2012 Restored completed as B&B style accomodation.